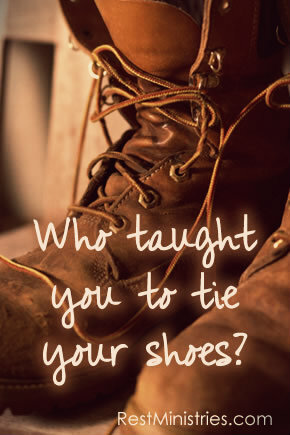 Who Taught You To Tie Your Shoes? Can something as simple as tying laces on shoes be a way that you can have a lasting impact on someone’s life? Karlton explains. “Not one of them grows tired or stumbles, not one slumbers or sleeps; not a belt is loosened at the waist, not a sandal strap is broken” (Isaiah 5:27). My aunt taught me to tie my shoes when I was a little boy. Over the years I have tied my shoes thousands of times and I have not forgotten my aunt’s kindness all those years ago. I doubt my aunt even remembers teaching me to tie my shoes, but thanks to her I have been able to put on my shoes everyday with tightened laces. I have traveled many roads and trodden many paths because of her help and act of kindness to a boy struggling with his shoe laces. Little things can mean much and can add up over time. Little acts of kindness or generosity can mean far more than we realize and do much good that we do not account for. I was recently talking to a lady who went on a missionary trip to India. She told me of the poverty, difficult conditions, and about showing love to the little children there. My guess is that those kids will never forget the kind lady from America who cared for them and showed them loving kindness. We may never be missionaries to India or to any other country. Yet I believe we can teach someone to “tie their shoes.” Through small acts of kindness we may be a blessing to others far more than we realize. Too often we are focused on our limitations brought about by our illnesses and diseases. Perhaps we should consider the small ways we might bless others or show some little act of kindness. It could have big benefits for someone else. Let’s not allow our limitations to define us, but rather find ways to bless people. Even if only through prayer, a kind word, or a generous act, we can be fruitful despite our illnesses and afflictions. Prayer: Dear Lord, thank You for the many acts of kindness that have come our way, and for giving us opportunities to show kindness to others. Amen. Karlton Douglas lives in Ohio with his lovely wife. It will take an eternity for him to thank everyone in his life who has shown kindness to him. Have you thought about how others have shown you kindness? What about ways you can show kindness to those around you? Filed Under: Devotionals, Loneliness, Self -Esteem, Spiritually Struggling, What's New? 4 Responses to Who Taught You To Tie Your Shoes? Thanks for the reminder of how little things can be a blessing. Because of having a hard time bending down, I sometimes struggle to get my shoes tied. Even just this morning, after yoga class, I sat down on the hard floor to put my sneakers on, then questioned why I would do that just to walk over to the locker room and take them back off. And yes, I walked across the gym to the locker room in my socks. It’s too much trouble for that short of a time! I’d ask advice from my friend who struggled at the end of his life to even put the shoes on, much less tie them, but unfortunately the end of his life has already come. I am blessed to have had slip on shoes once I showered and change my clothes, and I am blessed that in the morning, I can sit on the bed and tie my shoes. Some don’t have that ability, some don’t even have shoes. I’ll help where I can. Ellen, thanks for sharing your thoughts and experience.